So the Main Event is on and it sounds like today’s final Day 1 flight is going to be huge. Like mechagodzilla huge. 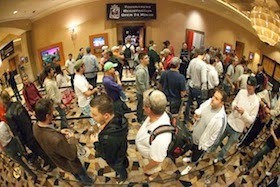 The largest ever starting day for a Main Event was last year’s Day 1c when 3,467 players came out. If they top that today, that’ll carry the overall total field size over the 6,352 who played the 2013 Main Event. Before the WSOP started I was asked to predict the total for this year’s ME and guessed 7,039, thinking that added satellites, a few WSOP.com qualifiers, and that big $10 milly first prize might help boost the total. Will be kind of a reach to get there today, but we’ll see. All this about Day 1 flights and field sizes got me thinking about the last decade’s worth of WSOP Main Events and the history of the multiple Day 1s. There had always only been a single Day 1 until 2004, the year Binion’s Horseshoe was overrun with players wanting to follow Chris Moneymaker’s footsteps to fame and fortune. Some that year had been predicting an increase in the number of participants from the 839 who played the Main Event in 2003, although few were guessing the jump would be so dramatic. As the preliminary events played out in 2004, predictions of an increase were bandied about, but few it seemed had an idea what was about to happen. In their history of the WSOP, All In: The (Almost) Entirely True Story of the World Series of Poker, Jonathan Grotenstein and Storms Reback talk about how Amarillo Slim Preston made a couple of $50K bets during the days leading up to the 2004 ME starting -- one that the field would break 1,000, then another that it would exceed 1,200. Of course, they’d end up with a total field of 2,576, a number well above what Binion’s could reasonably accommodate, and so a decision was made on the fly to divide that group into two Day 1 flights. After a lot of digging around I couldn’t put my finger on the exact number of entrants on each of those two Day 1s, although anecdotal accounts suggest there were more seated on the second day than the first. Totals for the Day 1 starting flights from subsequent WSOP Main Events were a little easier to pinpoint, although some of the info is scattered pretty widely, especially when looking back more than five years ago. But I think I found the answers in all cases, and so decided to compile it all here to have it in one place. I additionally tracked down the number of survivors from each individual Day 1 flight, although in a couple of cases I wasn’t too confident in the accuracy of the numbers and so decided not to include them here. Looking back over these totals, a couple of things stick out. One is how the fields for the Day 1 starting flights were approximately even back when the idea was first introduced. I seem to remember that players weren’t necessarily able to choose their starting days back then, which is how the WSOP was able to keep the fields roughly the same from flight to flight. Once players were able to select their preferred starting day, you see how the last starting day traditionally saw the largest field come out. Of those figures the 2,809 who played on Day 1d in 2009 stands out most starkly, as that was the year hundreds of players were actually turned away from the Main Event because of a lack of space. So how many do you think will be playing Day 1c today? 2) They created late registration flights extending into the 4th, then 5th, then 6th levels. If they were able to seat 7800 for a single day start for the monster stack, they'll be able to seat everybody who wants in today for the ME. I agree that unless something strange happens, there seems little chance they won't be able to accommodate everyone today.